This is the first detailed study of Britain's open source intelligence (OSINT) operations during the Second World War, showing how accurate and influential OSINT could be and ultimately how those who analysed this intelligence would shape British post-war policy towards the Soviet Union. Following the Nazi invasion of the Soviet Union in June 1941, the enemy and neutral press covering the German occupation of the Baltic states offered the British government a vital stream of OSINT covering the entire German East. OSINT was the only form of intelligence available to the British from the Nazi-occupied Soviet Union, due to the Foreign Office suspension of all covert intelligence gathering inside the Soviet Union. The risk of jeopardising the fragile Anglo-Soviet alliance was considered too great to continue covert intelligence operations. In this book, Wheatley primarily examines OSINT acquired by the Stockholm Press Reading Bureau (SPRB) in Sweden and analysed and despatched to the British government by the Foreign Research and Press Service (FRPS) Baltic States Section and its successor, the Foreign Office Research Department (FORD). 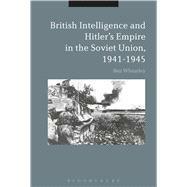 Shedding light on a neglected area of Second World War intelligence and employing useful case studies of the FRPS/FORD Baltic States Section's Intelligence, British Intelligence and Hitler's Empire in the Soviet Union, 1941-1945 makes a new and important argument which will be of great value to students and scholars of British intelligence history and the Second World War. Ben Wheatley holds a PhD in History from the University of East Anglia, UK.